Preheat the oven to 200C, gas mark 6. Put the chicken in a roasting tin, trickle over the oil; season well. Turn to coat. 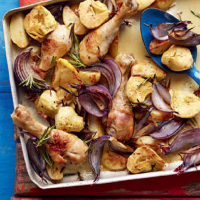 Quarter the potatoes and cut each onion into eight lengthways; stir these in with the chicken and rosemary sprigs, together with the halved artichokes. Quarter the lemon lengthways, squeeze over its juice and mix the quarters in with the chicken and vegetables. Trickle over the wine and lightly season. Place in the oven to bake for 40 minutes, turning halfway through. Squeeze over any remaining juice of the roasted lemons and serve. The lively fresh fruit of the Zenato Villa Flora from Veneto in Italy makes it an ideal match. This recipe was first published in June 2010.